Graduating high school senior Opal Wortman works mainly in acrylic paint. 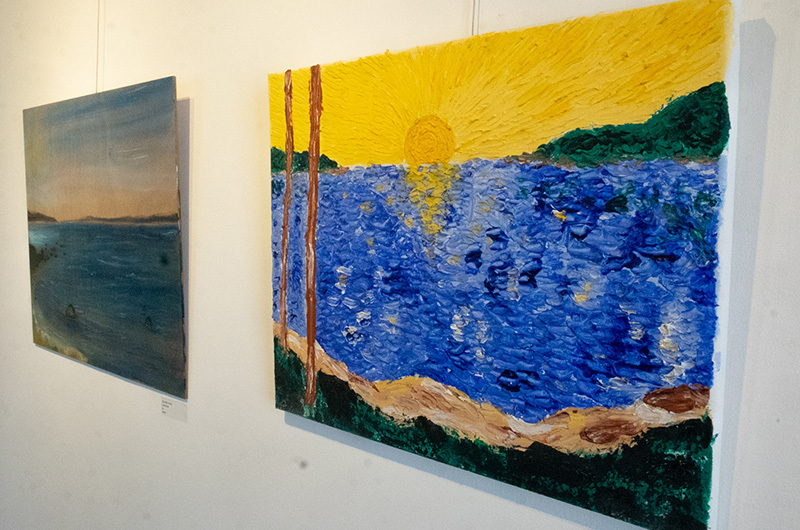 Walking into the Old Sculpin Gallery in Edgartown, visitors are greeted with a wide array of artwork, all crafted by a collection of established Island painters, sculptors and illustrators. But from now until June 22, art lovers have the opportunity to view the work of three Island artists in the early stages of their artistic careers. Martha’s Vineyard Regional High School seniors Opal Wortmann, Salyn Yancey and Olin Gannon were selected by the Martha’s Vineyard Arts Association to have their work displayed in the gallery as part of the annual student showcase. An opening reception took place on Sunday evening. Opal and Salyn were also awarded $1,800 scholarships by the MV Arts Association/Old Sculpin Art Gallery to help them pursue their artistic endeavors in college. Opal will attend Parsons School of Design in New York city this fall. “Seeing my work here is like a glimpse into my future,” she said at the reception. 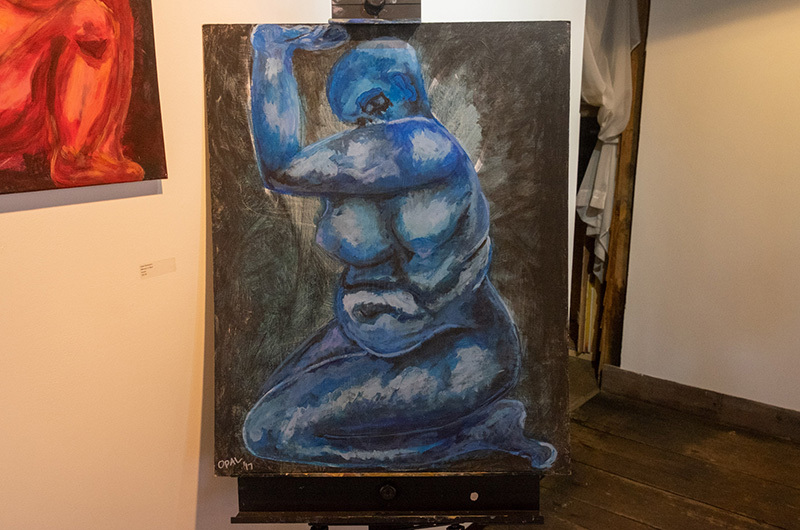 Working mainly in acrylic paint, Opal showcased a number of still-life’s, self-portraits and abstract pieces. Her favorite piece, Memory in Blue, exemplifies her close attention to detail, especially when it comes to relationships between different colors. The other young artists had similar sentiments when it came to their own “ah-ha” moments about wanting to pursue art. While Salyn said she was interested in art since she was a kid, it wasn’t until she met MVRHS crafts and sculpture teacher Brendan Coogan that she solidified her decision. “He definitely pushed me and made me really love creating art,” she said. Salyn will attend Alfred University this fall. Her display included many different ceramic pieces — from watering cans, to vases, to her personal favorite, small mugs adorned with a set of lips and a red tongue as the handle. Think the Rolling Stones logo in a more muted palate. “I was inspired by a post I saw on Instagram,” she said with a laugh. “I really wanted to show my best and most creative work. Olin also found his artistic niche in ceramics, although his main focus is crafting vases and flower pots. “I’ve loved art since sophomore year, so it feels good to see my work here in the gallery,” he said. Olin will also attend Alfred University in the fall. Olin said he finds inspiration in woodworking, though he chose to keep his display focused on one medium. He said he has a particular fondness for his piece Planter Tea Pot, a funky combination of a flower and tea pot, as the name suggests. “I think all of the students have a really solid understanding of the mediums they’re working in,” said Colleen Daly, who serves as the gallery’s director. Other gallery guests voiced their agreement, many of whom purchased pieces from the students before the reception was over. 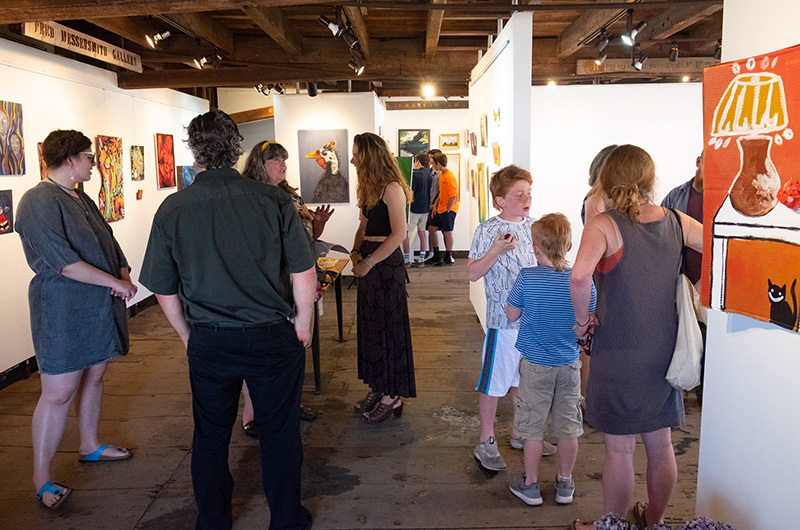 The student art show will run now until June 22 at the Old Sculpin Gallery, located at 58 Dock street, Edgartown. For more information visit oldsculpingallery.org. There hangs upon a wall at the summer home of Mr. and Mrs. C.
There is a “For Sale” sign on the boat shop of Manuel S.